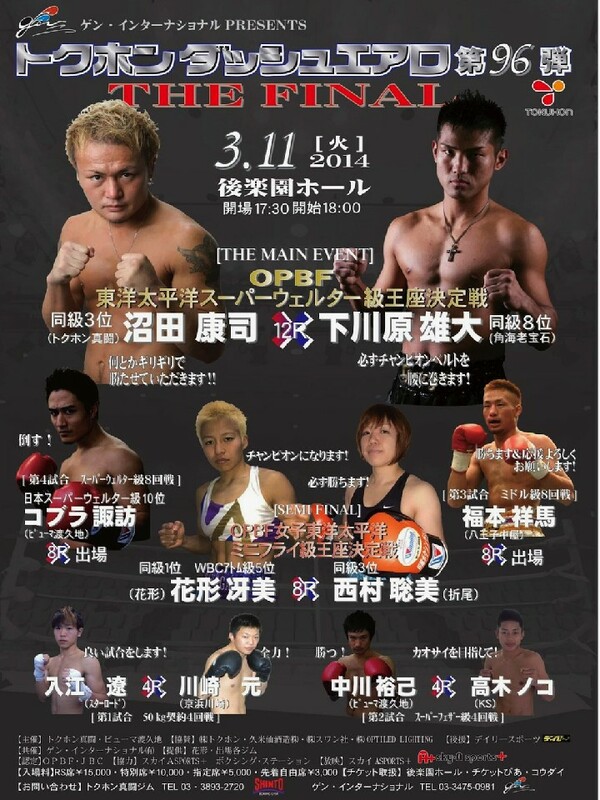 March 11th-Double OPBF title action in Japan! Mid-week boxing can often be disappointing with unimportant shows and mismatches being put on with little interest in really giving fans good value for money. This Tuesday however we get an excellent card with two OPBF title fights and some genuinely interesting looking action. The card in total features 6 bouts and whilst the lowest cards on the show are nothing special much of the card does look very interesting. One of the interesting undercard bouts sees Japanese Middleweight Shoma Fukumoto (2-1, 2) attempting to bounce back from his first professional defeat. Fukumoto will be fighting Korean champion Kyung-Joon Ahn (6-2-1, 5). Although Ahn is 0-2 in Japan he is a big puncher and this will almost certainly be a shoot out with the first man to connect almost certainly being favoured to score a knockout. Whilst the Middleweight clash looks like an exciting contest is really doesn't have the significance of the two title fights. The first of those will see former world title challenger Saemi Hanagata (8-4-2, 3) battling against the unbeaten Satomi Nishimura (6-0, 1) for the vacant OPBF Minimumweight title. The bout is a great one on paper and you could make a case for either woman winning though we do favour the more battled hardened Hanagata. The second title fight, and the shows main event, is an equally as enticing bout as Koji Numata (21-7-1, 16) fights Takehiro Shimokawara (19-8-2, 6) for the currently vacant OPBF Light Middleweight title. The title, given up by Charlie Ota, may not truly decide the best Light Middleweight in Asia but it should be a genuinely fantastic and highly competitive match up between very evenly matched fighters. As far as we're aware this will be the days only card though it does look like one that is highly important to the Asian boxing world.